Huawei Enjoy 9e entry-level smartphone appears on TENAA - Playfuldroid! This year alone, we have seen a lot of smartphones from different manufacturers and it appears that Huawei has decided to start the year with an entry-level device. In the second half of 2018, Huawei launched the Enjoy 9 Plus, Enjoy and Enjoy 9 MAX. However, the speculated Huawei Enjoy 9e entry-level device was not released. Today, a new smartphone from the Chinese manufacturer, passed through TENAA and the device is believed to be the unreleased Enjoy 9e. According to the TENAA listing, this smartphone comes with a waterdrop design with the front camera positioned at the middle of this smartphone. On the rear, there is a single rear camera and there is no fingerprint sensor. It is most unlikely that this device will have an on-screen fingerprint sensor as it is an entry-level device. Thus, the new MRD-AL00 is most-likely the unreleased Huawei Enjoy 9e. On the core configuration, it will be equipped with an entry-level chip, possibly a MediaTek Helio P35 processor. The MediaTek P35 SoC is built on a 12nm process, with an eight-core design and the CPU clocks up to 2.3GHz. It has an IMG GE8320 GPU clocking 680MHz. 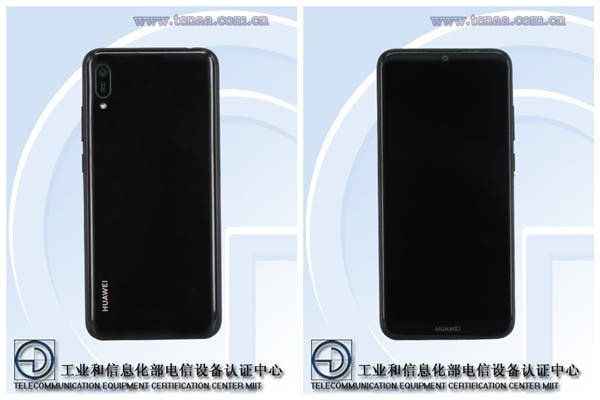 In addition, as an entry-level mobile phone, the display of the Huawei MRD-AL00 should be 720P (probably 1560×720) and the body material may be plastic. We expect it to come with the EMUI 9.0 system pre-installed. As for the price, this device is expected to be less than 1,000 yuan ($148).